When Wacky Packages were first introduced, fans and collectors were encouraged to decorate their binders with the satirical stickers. The idea of special binders designed to hold cards wouldn't come along to the hobby for a couple of more decades. Making up for lost time, Topps has released a series of limited edition Wacky Packages binders sold initially only on their online store. Sold only in sets, the 2013 Topps Wacky Packages Binder Collection includes 17 total binders as well as several other exclusive goodies. The 2013 Topps Wacky Packages Binder Collection is being released in four waves with each wave having four binders. The first set (Series 1-4) ships in May with other sets slated for July, September, and November. The cost for each set of four binders is $260 at the online Topps shop. Each binder is limited to 150 copies. Binders come decorated with classic-style Wacky Packages art from the likes of Brent Engstrom, Joe Simko, Neil Camera and Matthew Kirscht. The cloth-bound binders have a 3/4" D-ring design. This means each set is a nice size to safely protect a single set of vintage Wacky Packages stickers but there likely won't be a lot of room left over. 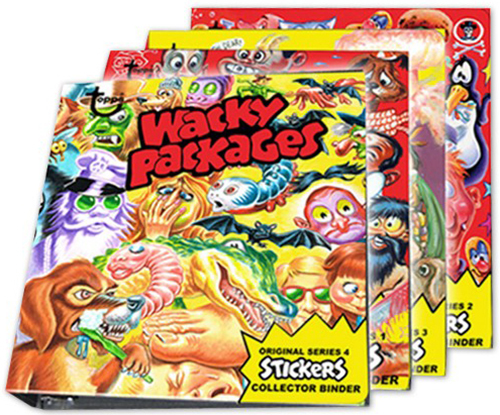 Every binder in the 2013 Topps Wacky Packages Binder Collection comes with some exclusive cards as well, including a sketch card and numbered certificate of authenticity signed by a Wacky Packages artist. An artist bio card, a nine-piece puzzle and checklist, and three Wacky ad-style cards are also among the cards included with each binder. A Lost 17th Series binder is available as a bonus to those who order all four sets. It will not be sold separately by Topps. WACKY PACKAGES ADS 1969 # 26 KOOK CIGARETTES PSA 7 NM! TOUGH!! 1973 Topps Gum Co Wacky Packages 1st Series Sticker Purple Display Box RARE! 1982 Topps Wacky Packages Cereal Box Panel Beastball with Border RARE! 1973 Topps Gum Co Wacky Packages 3rd Series Sticker Blue Display Box RARE! 1982 Topps Wacky Packages Cereal Box Panel Foolball RARE! 1982 Topps Wacky Packages Cereal Box Panel Beastball RARE!